The cultural context of business has changed and today, people believe their lives have an impact and hold their brands to this higher bar. Customers, employees and forward-thinking investors no longer see meaning as just nice to have, but now gravitate toward businesses and organizations that deliver it. This shift in belief calls for a wide range of disciplines such as marketing, design, engineering and production, to collaborate in generating purposeful value. As Simon Sinek states: "People don't buy what you do; they buy why you do it. What you do simply proves what you believe." According to a study conducted by Debbie Millman, of Sterling Brands, over the past one hundred and fifty years, customer expectations of brands have undergone a series of transitions. These transitions continually redefine the quality of relationship and dimensions of value delivery required for the success and sustainability of brands. In the late eighteen hundreds, users wanted "quality, consistency and safety" (1876-1919) - "Just give me a product that actually works." Then, in the early nineteen hundreds, increasing product choices challenged brands to "differentiate" their offerings via features and benefits and anthropomorphizing became important - think Betty Crocker, Dr. Pepper, Mercedes and Marlboro (1920 - 1964). During the mid-to-late nineteen hundreds, Baby-Boomers demanded more from their brands and the act of purchasing also became a means of "self-expression" (1965-1984). Illustrated by Red Bull, LaCoste, Hushpuppies and Jeep. Generation X began seeking brands as "experiences" (1965 - 1976) such as Urban Outfitter, Interrail, Starbucks and IKEA. In the last transition of brand-value demand, the world is more interconnected, thus, change happens quicker and news travels faster. The outside world has moved closer and our world seems less predictable as a result. Millennials (1977 - 1995) and Centennials (1996 and later) are living with hyper-change as the metronome of their lives. The forces of globalization and technology forged Millennials (now society's largest birth cohort). The Centennials are growing up in a post-9/11, climate-change-kind-of-world. Both generations are desperately seeking to make the world a better place, are driven to "make a difference" and associate their identities with brands that seek the same. 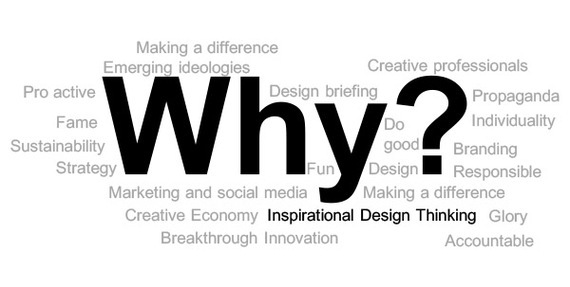 How does an organization develop its brand and deliver on promises that "Start with Why?" When internal stakeholders ask, "Why are we doing this?" or when customers ask, "Why am I buying this?" it substantially heightens the critical relationship between strategy and brand. Brand is strategy in action and intentional brands have a higher purpose that frames the context of the products, services or experiences they create. Meeting business financial goals is a must, however is only table stakes in the challenge to attract and retain customers in today's cultural context. Take for example a seeming commodity type business--green tea. Working the nexus of strategy and brand, could one build a business where "Why" is part of the sensory experience of the product? Organic India does this beautifully. The company positions their tea as a "Vehicle of Consciousness." Is this just a clever and lofty claim? Hardly. The business strategy is built on this bedrock. When one opens a box of Organic India tea, the first thing one sees is a small booklet that instantly shifts the perception and meaning of what's in the box. The booklet declares a Why for the business-- an ideology or belief, one that makes a difference and makes the user part of the story. One might say that's all well and good for a tea business, but can one innovate technology businesses on the foundation of "Why?" Apple's purpose statement infuses everything they do--it's part of the sensory experience of the brand: "We want to make a contribution to the world by making tools for the mind that advance humankind." Mission continually accomplished. In pursuit of Why, and the execution of your business - products, services or experiences - Inspirational Design Thinking may offer some refreshing insights and methods on how to make purpose one's guiding star. Instead of uncritically guiding offerings by what customers say they want, Inspirational Design Thinking first explores breakthrough innovative opportunities via a taxonomy of Big Questions under the main heading: Love, Courage and Accomplishment. Once a big enough "Why" has been identified that resonates with the organization's culture, business opportunities are conceptualized and customers' insights and opinions solicited, all followed by the established Design Thinking process. In this way the Why - How - What are connected and a comprehensive and a cohesive meaningful brand message is developed. Branding from Why is a strong beginning, however if customers sense the organization is inauthentic, its business will not stand the test. Upcoming generations will continue to keep organizations feet to the fire with their focus on measurable actions. Business Courage Big Questions Love Why?